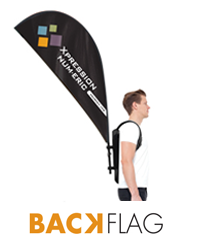 We are proud to offer the best range of promotional products for all your outdoor advertising. 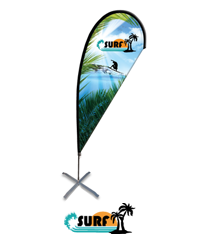 Advertising and promotional flags (also known as Beach Flags) are ideal options for outdoor events. 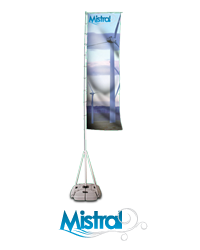 These flags are wind resistant and designed to adapt to various conditions. Our experts will help you find the one that best suits your needs and budget. 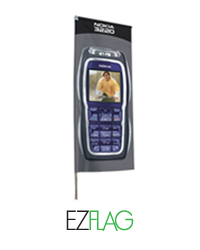 Flags will attract the attention of any crowd. They are your allies at fairs, festivals and other outdoor events. 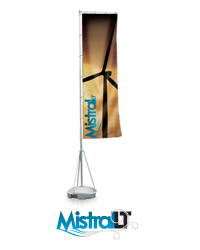 Easy to install, they offer endless opportunities to promote your brand image. Several models of bases are available to hold the flag and you also have the option of attaching it to your Gazebo structure! The exhibition flag specialists will also help you choose which graphic elements to showcase to best draw attention to you. A graphic design service is available so you can focus your energy on managing the big event. Exhibition marketing allows you to acquire new clientele and increase your company’s popularity. 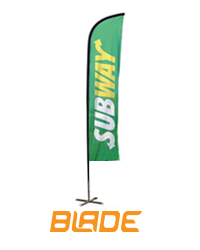 Promotional flags will make you stand out from the competition and attract customers to your products and services.